< I Voted For Jill Stein, and I Feel Fine! Sam Harris on the Brink of Having an (Intellectual) NDE? Previously, I posted my take on this whole Sam Harris vs. Dr. Eben Alexander controversy. Since then Sam Harris has received flak from people who are informed on the science of NDE (present company included). I think that some of that criticisms hit a nerve which prompted Harris to write a follow up post on his blog. See Science on the Brink of Death. In his latest post Sam Harris called Skeptiko a “parapsychology podcast” (which is not entirely true) and Alex Tsakiris as “irritating and unscrupulous host” (I’ll just let Alex respond to that) without even having the courtesy of linking to the content that Harris was reacting to. Yeah, how transparent of you, Sam! What’s the matter? You don’t like your readers to easily see your email exchange with Alex? 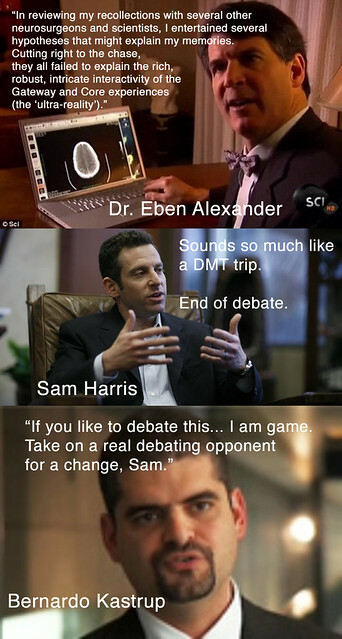 Anyway, as I’ve said in my posts in various discussion threads, it would be too tempting for Sam Harris to turn down a debate with Dr. Eben Alexander, especially now that Alexander has become a best-selling author. So it’s now looking like a Harris v. Alexander might eventually happen. Jeesh, I do make it sound like a Floyd Mayweather vs. Manny Pacquiao fight. But Harris is no Pacquiao. He’s more like Mayweather in this analogy since he’s the one doing all the thrash talking. LOL. Popcorn please! However, compared to Harris’s original post, his follow up post at least has more substance and more interesting. First, he gives us a clue that he has read the book “Irreducible Mind” which he quoted in the opening of his post. (Maybe that’s one reason why Sam Harris is open to the mystery of consciousness and not a staunch materialist, or so he says.) Second, he referred to the classic NDE case of Pam Reynolds. Third, Harris has finally read Dr. Alexander’s book. And fourth, he narrated a seemingly *psi* experience he had in a dream with Tibetan Vajrayana Master Dilgo Kyentse Rinpoche. If you haven’t read it yet I recommend reading Harris’s post in its entirety first and then come back here when you’re done. At first I was planning to write my own rebuttal to Harris’s post. But after reading some reactions on the Skeptiko forum and Bernardo Kastrup’s excellent rebuttal I’ve decided to just piece together some of the more eloquent critiques which point to Harris’s own *lazy and tendentious* thinking. I’ll start with Steve Volk’s (author of Fringe-ology) post on the Skeptiko forum. Another Skeptiko forum member took issues with Sam’s characterization of Dr. Sabom in Pam Reynold’s case. This is really sleazy and cheap. If you read Sabom’s books, whether it’s the extremely rigorous 1982 Recollections of Death, or his 1998 Light & Death where he “comes out of the closet” about his religious beliefs, his approach to the study of NDEs throughout is extremely prudent and scientific. Now myself I would argue Sabom’s logical conclusion, but does this sound like a man trying desperately at all costs to “substantiate the otherworldly significance of the NDE”? To use Harris’ own words, it is “excruciatingly obvious” that he has not read Sabom’s book and is content to characterize him with superficial knowledge of the book and its author. For those of you SERIOUSLY interested in the Reynolds case, the Journal of Near Death Studies had a recent issue entirely devoted to it (Fall 2011), with a critique of the case by anesthesiologist Gerald Woerlee and responses by Stuart Hameroff and Chris Carter. Then Alex Tsakiris started a thread to address a number of points that Sam Harris apparently got wrong. “Here Harris seems to be casually taking for granted that memories are encoded as physical traces in the brain, just like files stored in a flash card. Yet, decades and decades of research have failed to find these physical traces. Modest recent progress in that direction is self-contradictory, as a cursory comparison of this and this article shows. The fact that brain damage can impair memory only establishes that one can physically impair access to information, but doesn’t establish at all where this information comes from…. “Harris also asks why spiritual insight isn’t triggered as a result of brain damage. Well, it is! Let’s forget the anecdotal evidence and focus on controlled studies. A 2010 study published in Neuron shows precisely a correlation between surgery-induced brain damage and spiritual insight. Moreover, most, if not all, techniques for the attainment of spiritual insight seem to operate by causing a reduction of brain activity—think of ordeals, hyper-ventilation, sensory deprivation, psychedelics, meditation, and even prayer—which is entirely consistent with the hypothesis that the brain limits conscious experience. I elaborated extensively on this before, in the article linked here. “Again, Harris seems to be, at best, confused and ignorant of the facts; or, at worse, wilfully biased in his appraisal of the available data. His quote above describes precisely the facts as we know them, even though he uses it rhetorically, as if it were all obviously untrue. The irony would be sweet if it weren’t concerning as far as what it seems to say about Sam Harris. The only part of the quote that I think is false is Harris’ statement that ‘most forms of brain damage’ should lead to new insights. We don’t know whether this should be the case for ‘most forms,’ for we do not yet understand how the brain filters and limits conscious experience. All we can say is that, for at least some forms of brain damage, insights should be triggered. As if his excellent rebuttals to Harris were not enough, Kastrup also challenged Harris to a debate! Oh, snap! Here’s what Kastrup posted on his FB page. Well this just got more interesting! Maybe Harris will just ignore this challenge since Kastrup is not a neuroscientist or not (yet) a best-selling author. But didn’t Harris also say this about Dr. Eben Alexander’s credentials? Bernardo Kastrup is not a neuroscientist or a neurosurgeon or a best-selling author like Sam Harris and Dr. Eben Alexander. Kastrup is more of a philosopher and a deep thinker who informs himself on topics like neuroscience, philosophy of mind, NDEs, and has taken an alternative view on the mind-body problem. But, IMHO, Kastrup is thinking more like a real scientist compared to Harris, at least on the topic of NDEs. Kastrup has not only drawn a reasonable and informed alternative view on NDE (which he hashed out in a series of blog posts) but even backs up his speculations with citations to studies on mainstream science journals and other scientific publications. …he [Sam Harris] shows that he is not familiar with the subjects and evidence he is alluding to. What he wrote is what one would perhaps write after a brief and cursory reading of a new field. Disgraceful for someone with his media exposure and reputation. Based on what I’ve seen Harris has written so far on NDEs, I concur with Kastrup’s above assessment. Bottom line: The onus is now on Sam Harris to demonstrate how much he really knows and understands about the science of NDE. So far, I find his knowledge of NDE science not only lacking but also tendentious. P.S. NDE skeptics like Sam Harris often resort to “but they did not actually die” talking point. For Harris you haven’t really died “unless we could know that a subject’s brain was not functioning” and that you stayed dead. But anyone who has done some deep reading of the NDE scientific literature understands that based on clinical definition of death, some patients who had NDEs really died and would’ve stayed dead if not for the current advances in resuscitation technology. Case in point: Here’s one of the prominent NDE researchers, Dr. Sam Parnia (who is currently doing a long-term study on NDEs called the AWARE Study). In this talk Dr. Parnia clearly explained how clinical death is defined in the medical field. Surely medical doctors are in a better position to define clinical death, right? Maybe Sam Harris has a better definition of what clinical death is? P.P.S. Oh, snap! Dr. Eben Alexander has just responded to Sam Harris. Sam Harris just added footnote #2 in response to the brain as “reducing valve” theory. “(Added 11/16/12) The phrase “reducing valve” appears to come from Aldous Huxley in his Doors of Perception, but the idea that the brain is a filter (rather than the origin) of mind goes back at least as far as Henri Bergson and William James. Both Bergson and James suggested that the purpose of the brain might be to limit conscious experience to a range of perceptions and mental states compatible with survival in this world. When the barrier of the brain is breached—whether partially, through mystical experience, or fully, upon the death of the body—a wider range of conscious states and cosmic understandings become available. when Sam Harris was interviewed by Steve Paulson on “To the Best of our Knowledge”, here’s what he said. so I’m wondering why he was so hostile and insulting to Dr. Alexander when Sam is really more like an *agnostic* on survival of consciousness beyond the brain/body. the bottom line is we simply do not know. the NDE phenomenon is another mysterious puzzle in the hard problem of consciousness. Paulson: Now the really interesting thing about listening to atheists on consciousness is they’re actually all over the map. Sam Harris, who is a neuroscientist, he has a Ph.D. in neuroscience, he has a very different view. It’s entirely possible that there could be life after death. He is not willing to rule that out. Sam Harris: There are good reasons to be skeptical of the naive conception of a soul and so that the idea that the brain can die and a soul that still speaks English and recognizes Granny is going to float away into the afterlife, that seems to be profoundly implausible. And yet, we do not know what the relationship between subjectivity and objectivity ultimately is and… For instance, we could be living in a universe where consciousness goes all the way down to the bedrock so that there is some interior subjective dimension to an electron, say. Paulson: That’s interesting, though, because most evolutionary biologists, I mean I’m in particular thinking the, the secular ones would say, “Of course, consciousness can not survive the brain. It will not survive death.” You are not willing to make that claim. Harris: Yeah, I just don’t know. If we were living in a universe where consciousness survived death in some sense or just transcended the brain so that, you know, that single neurons were conscious. We would not expect to see it by our present techniques of neuroimaging or cellular neuroscience, and we would never expect to see it. There are profound philosophical and epistimoligical problems that, that anyone must confront who’s trying to reduce consciousness to the workings of the brain and this discourse is in its infancy, and who knows where it’s going to go? “Harris wrote an addendum to his post, which you can find here. In it, he equates the ‘filter hypothesis’ to what is known as the ‘transmission hypothesis,’ according to which consciousness is a kind of radio signal received by the brain. He then proceeds to correctly point out the problem with the transmission hypothesis, which is that we are supposedly the signal, not the radio. However, although the transmission hypothesis entails the filter hypothesis, the filter hypothesis does notnecessarily entail the transmission hypothesis. As a matter of fact, the filter hypothesis doesn’t even entail dualism! My own metaphysical position, for instance, is not dualist. Yet, the filter hypothesis holds well under my views, as I wrote about in this earlier article, which I encourage you to read. According to this article, the brain is the partial image of a process by means of which mind localizes itself, ‘filtering’ everything else out. Notice how this solves Harris’ question: Instead of being an external ‘signal’ that is no longer being received, but which we still are, in my formulation mind folds in on itself in the form of a vortex, limiting its own breadth. We are mind, and yet mind self-limits. Under this formulation, to say that electrochemical processes in the brain are the cause of consciousness is as illogical as to say that lightning is the cause of atmospheric electrical discharge; or clots the cause of coagulation; or fire the cause of combustion. Fire is the partial image of the process of combustion as viewed from the outside and, as such, correlates very well with the process it depicts; just as electrochemical processes in the brain correlate very well with conscious states. It is true that even I have used the radio metaphor when discussing the filter hypothesis. After all, the analogy is a very handy, metaphorical device to convey certain ideas. For instance, I once wrote a fairly elaborate explanation of the filter hypothesis under an implicit dualist metaphor. The article is availablefrom here. But my use of the radio metaphor does not mean that I believe consciousness to be literallysome kind of external signal being received by the brain. I don’t. Assuming that would amount to taking the metaphor way beyond its intended scope. “Since telling my story here, I’ve been amazed and profoundly gratified at how powerfully it has resonated with people all over the world. But I’ve also weathered considerable criticism—in large part from people who are appalled that I, a brain surgeon, could possibly make the claim that I experienced what I did. “I can’t say I’m surprised. As a scientist, I know that the consensus of my tribe is that the self is created through the electrochemical activity of the brain. For most neurosurgeons, and most doctors generally, the body produces the mind, and when the body stops functioning, the mind stops, just like a picture projected on a screen does if the projector is unplugged. what i don’t agree with is Harris’s *doublespeak*. he contends that he’s open-minded when it comes to the mystery of consciousness (note: Harris admitted this in a number of his writings), yet when presented with a cutting-edge science of NDE his knee-jerk reaction was to default to a brain-based materialistic paradigm of consciousness. he says that he’s familiar with the NDE literature, but so far he has only displayed a shallow knowledge of the field. take the second point for example: “to demonstrate that the subject had acquired knowledge about the world that could be explained only by the mind’s independent of the brain”. although it’s true that it would be almost impossible to prove this without the brain (since the person has to be alive to share the experience in the first place–a catch-22), there are cases wherein people who had NDEs had seemingly obtained knowledge that were not known (see the famous case of Walter Russell). based on the research of PMH Atwater, in a lot of NDE cases, people had increase in intelligence and that they had access to knowledge that they have otherwise would not have known. they also credit their NDE as a “source” of these knowledge. so based on this data, at the very least, the “paranormal” or psi (which the term I prefer) component cannot be easily dismissed using the current neuroscientific and materialistic paradigm. this is the reason why I remain agnostic and truly open-minded to this topic. NDE science is the cutting-edge of consciousness studies! and it should be treated as such by people like Harris who champion science, critical thinking, and open-mindedness on the mystery of consciousness. bottom line: NDE is a mystery. whether we’ll eventually find an answer to the “hard problem of consciousness” in the quantum realm, or whether we’ll eventually jettison the materialistic paradigm in favor of a more wholistic nondual panpsychism-like paradigm where there is no distinction between the natural world and the paranormal, or whatever; who the f**k really knows? IMHO, a true skeptic worth the label would go down the NDE rabbit hole, follow the data wherever it leads, and relish the mystery of consciousness for it won’t be a mystery if we already know the answer. this is a great interview with NDE researcher extraordinaire, PMH Atwater, at The Paracast. for those who are not into NDE research yet, PMH Atwater is a must-know figure in this cutting-edge field. you’re welcome! was once a enjoyment account it. Glance advanced to more introduced agreeable from you! This was posted by c4chaos on Tuesday, November 13th, 2012 at 9:13 pm. Bookmark the permalink.